Whilst KS2 entitlement still stands, it’s uncertain and as yet there are no clear messages from the coalition about whether they will or won’t be statutory. We’re also in the middle of a huge curriculum review of both secondary and primary education. But change can provide us with opportunities to reassess and reflect. Change often happens simultaneously, sometimes across sectors too. 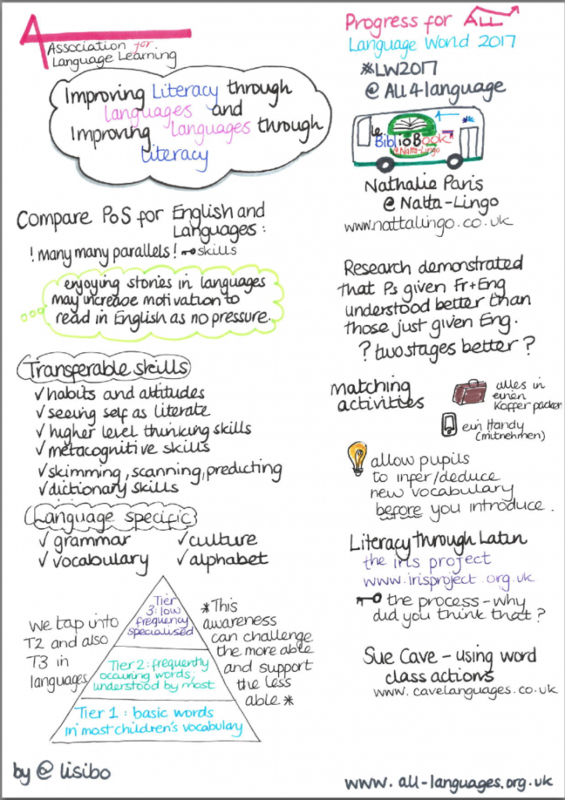 Many issues that arose with Nuffield are seen replicated now – developing languages vertically down from KS3 but also horizontally across ability range at time when languages were elitist. At the same time, comprehensive education began. National Language Strategy brought some coherence to languages in England – many success stories especially in primary phase, widening of choice post-14 etc. 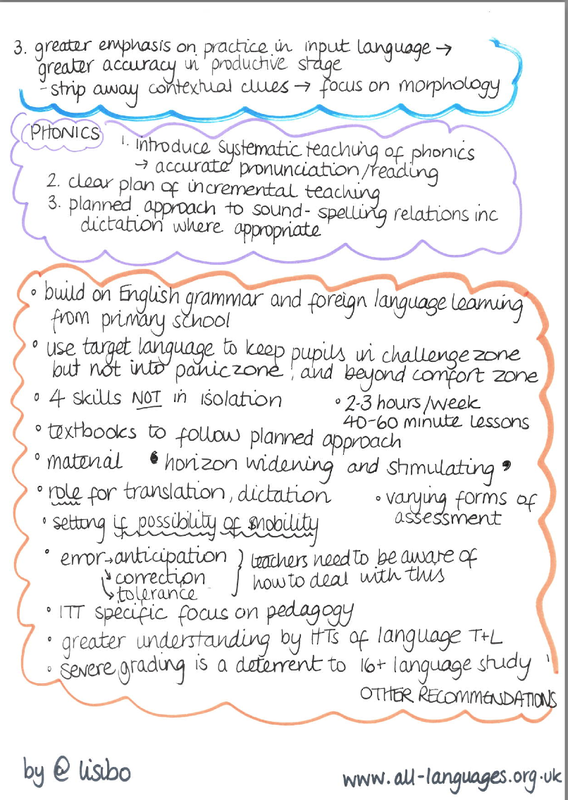 KS2 Framework has been a key document in bringing coherence to primary provision. 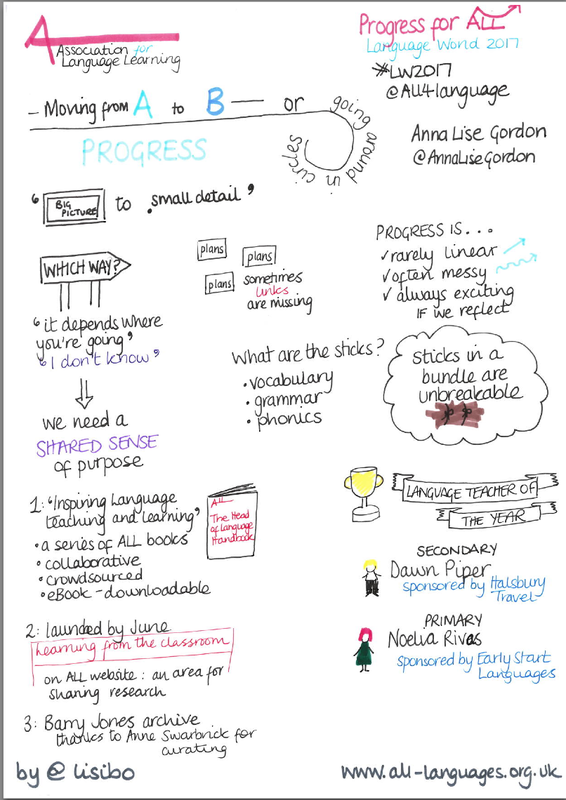 In 2009 92% primaries offering language in KS2 and 70%+ offered throughout the school. 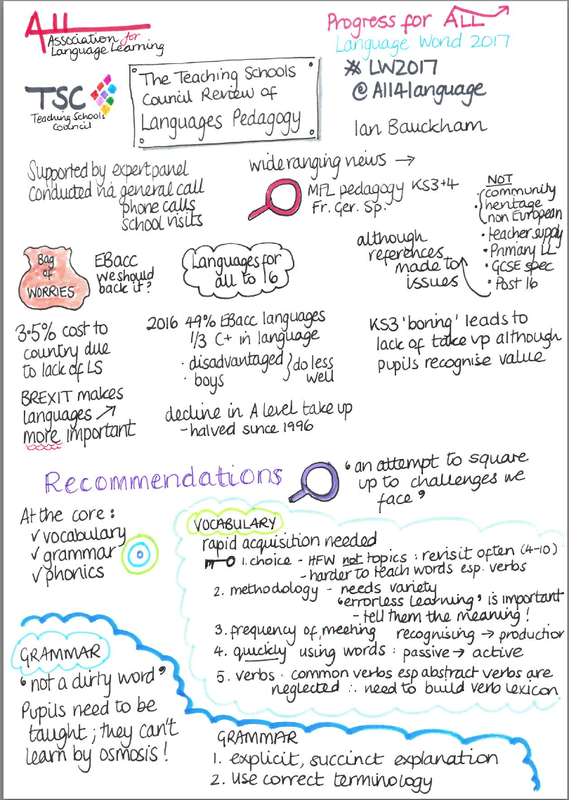 MFL KS3 Framework arrived with an emphasis on understanding pattern, structure and grammar, but lessened target language in the classroom. Building for the future – what do we need? 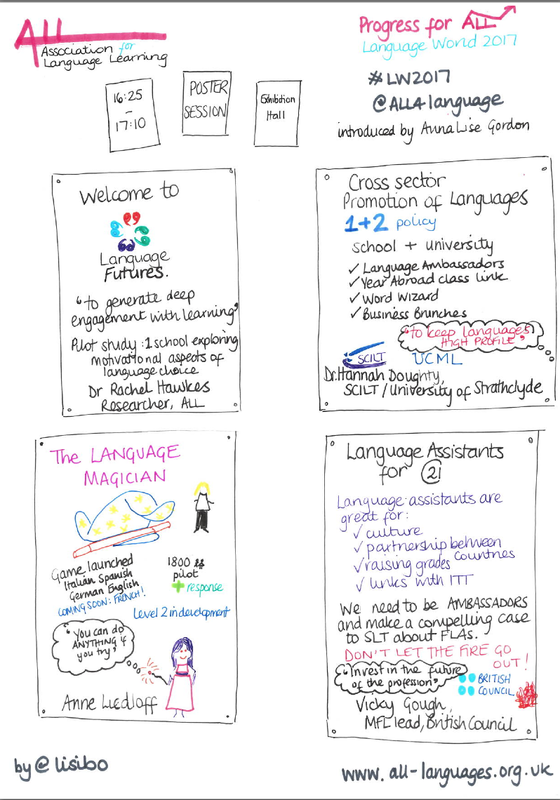 We believe that language learning and teaching are an essential part of rounded education for all UK citizens. We believe that all learners should have the opportunity to learn their first language and at least one other language, including English, if this is not their first language. We believe that languages teachers should have access to high quality initial teacher training and continuing professional development. We advocate statutory status for languages from 7-16.
adequate time allocation should be provided in the curriculum to allow pupils to elarn to a similar standard to their peers in other major jurisdictions. 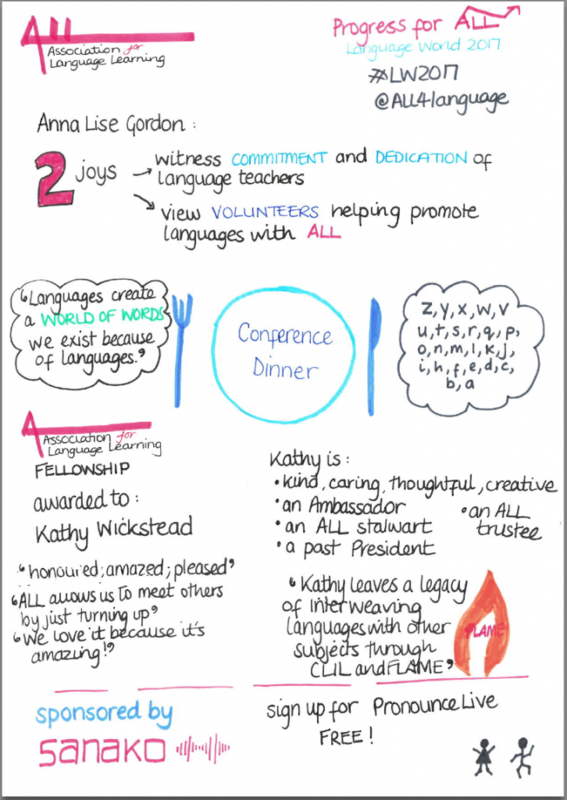 Why do we need language skills? Learners experienced 3 sequences of 5 lessons over 3 terms. The project marks a development of work done by the BFI on using film in literacy, moulding it to the needs MFL teachers in mind – Cine-minis a DVD of short French films is the result. 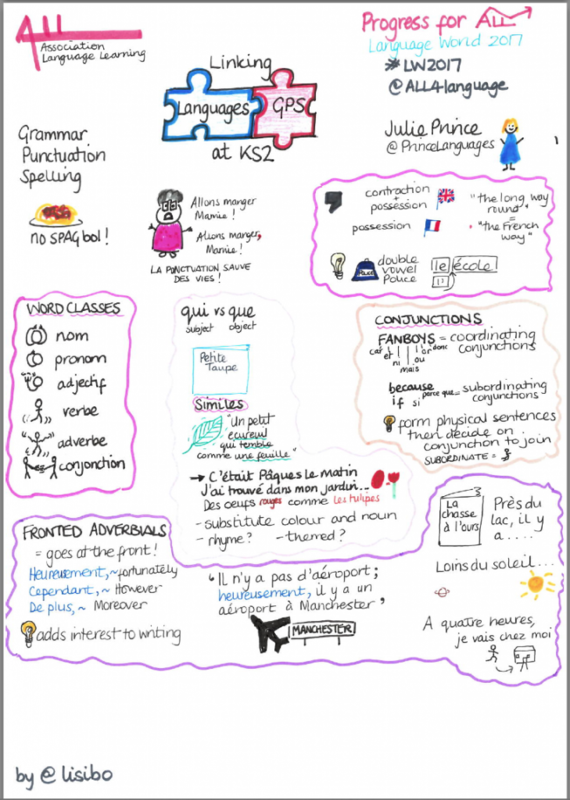 One of the techniques used was “Tell me” grids with boxes for story / mood / character / setting – en français, qu’est-ce qui se passe? / ambience / qui? / où? ou quand? The soundtrack of the start of the film is played and learners fill it in with their ideas. This encourages learners to build up pictures from sounds in their head, drawing on their knowledge of the world and of film / narrative / text. Once the first part of the film is shown, another grid considers surprises – is it as you expected? And what’s going to happen next? I’m not going to spoil it, but we watched Les crayons and it was very unexpected! Muriel was one of the four teachers involved and she shared the outcomes for her and her pupils. It motivated her pupils greatly, leaving them more willing to take risks without necessarily realising it. 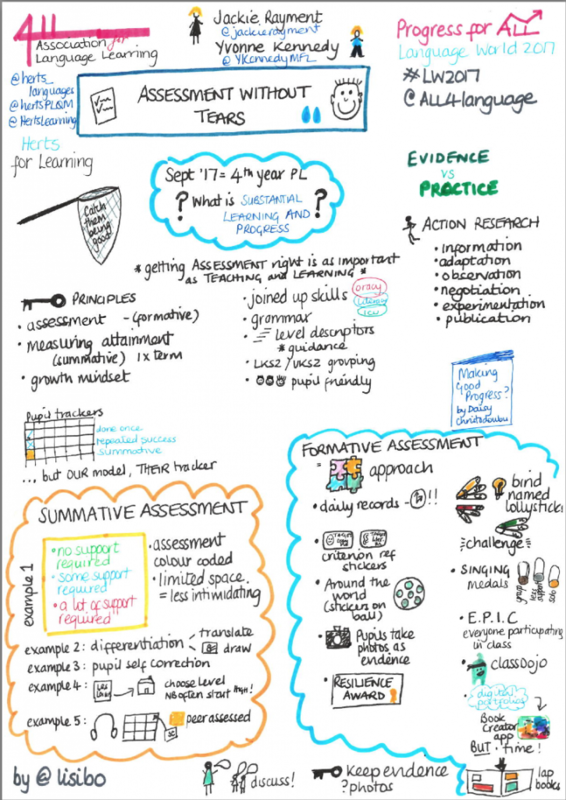 It took them out of their comfort zone whilst easily linking to curriculum, using the lack of prescribed content to an advantage. Muriel reported that you need to have confidence to take risks professionally, to try out new ideas, be original and develop yourself professionally -and that this was an opportunity that she was given and took. 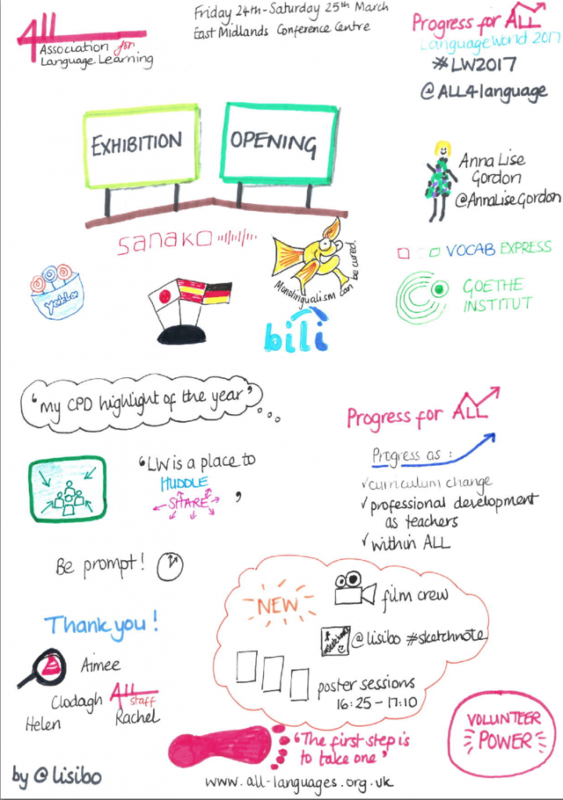 And here are some free downloadable PDFs of information about film and languages. 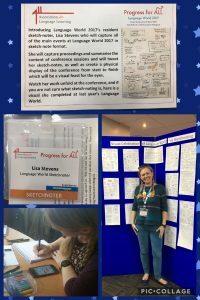 My presentation at Language World this year took it’s theme from the fact that Primary language learning is an entitlement rather than statutory as we had expected a year ago. 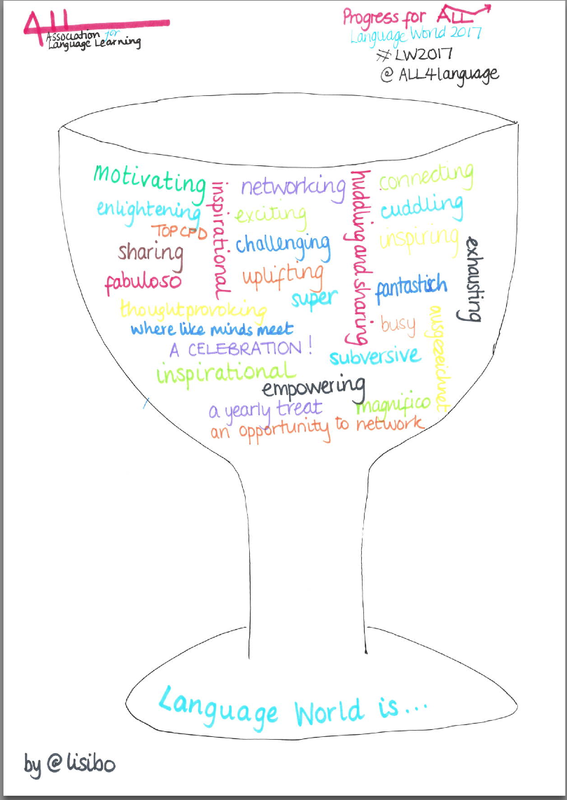 In it I explored what an entitlement meant and shared some ideas of how it might look and what it should include. Thanks to the people who attended on a hot Friday afternoon in the 6th session of a long and exciting day. I’ll put the audio with the Slideshare once I have time to edit it! 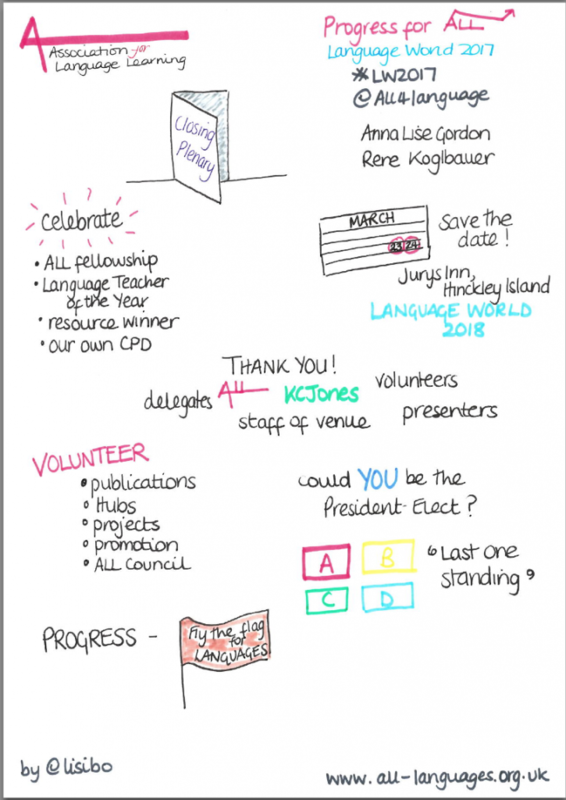 #LanguageWorld2011 – Make it real! Use authentic materials to make it real! All sorts of reasons why online resources are particularly useful – one might be that textbooks are out of date as soon as they’re published! Chris’ presentation is on his website so I’m not going to recap blow by blow – just some notes! Needless to say, he was brilliant and will be missed when he goes Down Under. Belief – I can’t do it yet…. 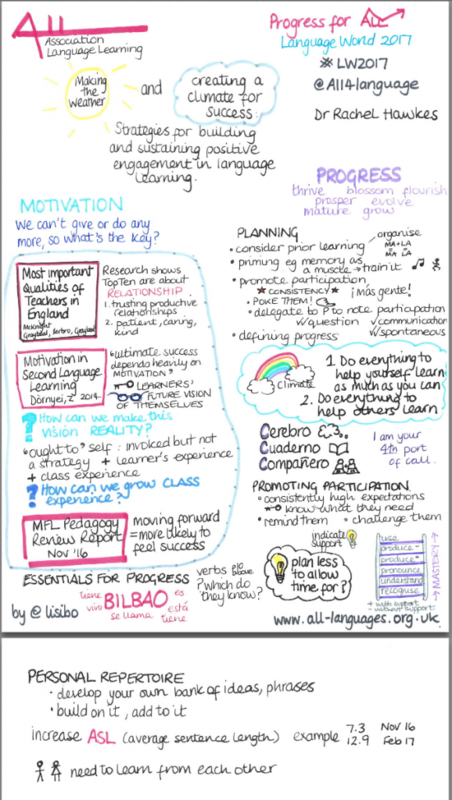 Do we want our pupils to be engaged? Yes, but you can be engaged without being challenged. Harry Potter clips – OWLs – watch this clip from about 2 minutes and substitute the word ‘spells’ / ‘magic’ for languages. Sound familiar? A failed GCSE is a lost life chance so we want them to pass but how soul destroying to feel you have to stick to learning chunks of language to satisfy an examiner who wants to test what you CAN’T do. A textbook exclusively endorsed by an exam board means that I will follow it slavishly because I want my pupils to pass. Where’s the room for creativity? Testing what you don’t know is not fair. If you want learners to make connections between language, you need to provide them with something with which to make the connections, so we need to give them texta not just words. 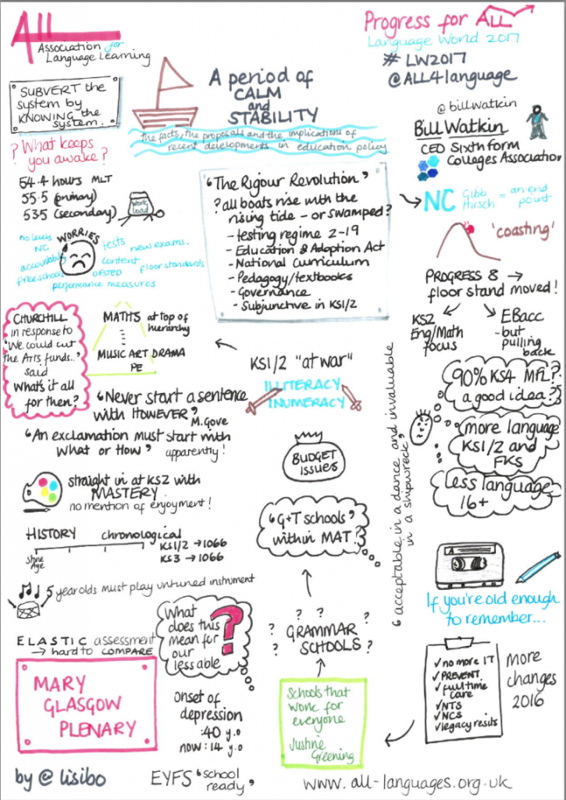 Having taught KS3 with films, murder mystery etc, why should we have to go back at KS4 to teaching pencil sharpener! If you want to see Chris in action presenting on the same theme a few months ago, check him out here and here. 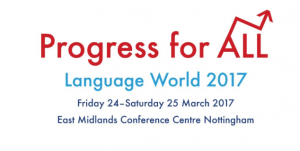 #LanguageWorld2011 – Progression in reading and writing – and still having fun! 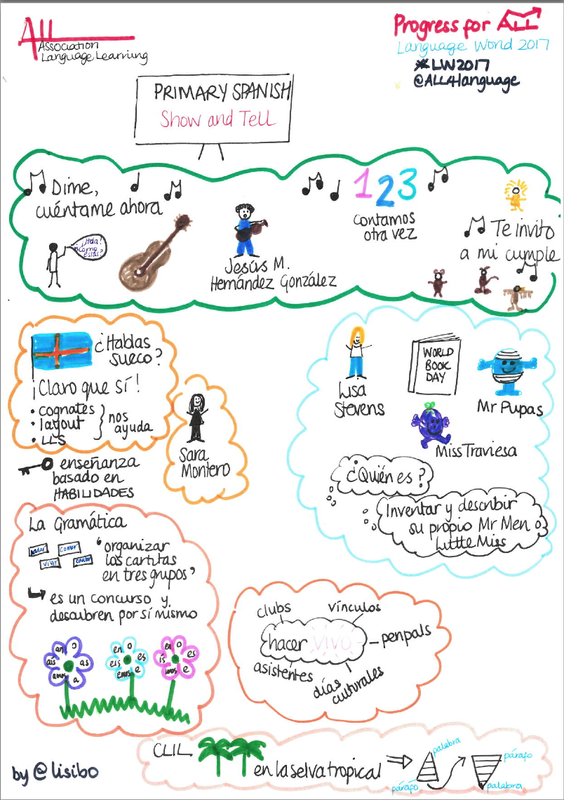 Progression in reading and writing … and STILL having fun! 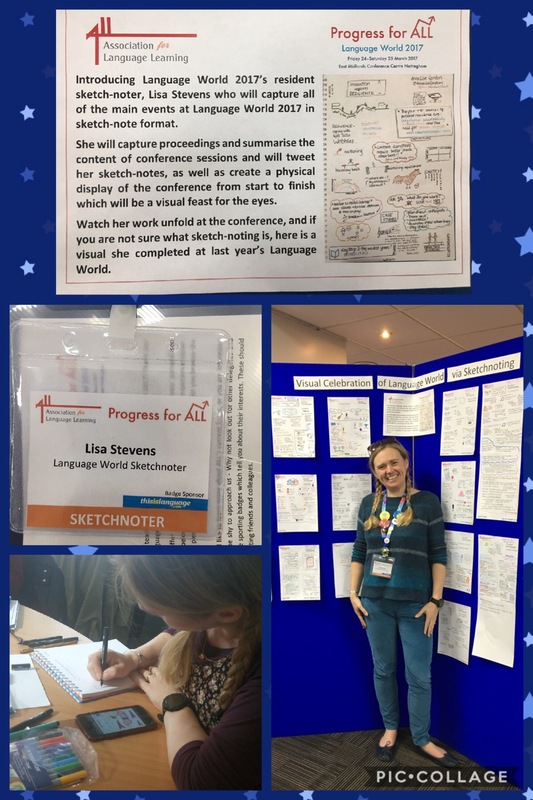 Ina whistle stop tour of reading and writing in KS2, Jan showed that teaching reading and writing need not be onerous, scary or boring, but fun and creative! Here are my notes – I was too busy drawing, singing and making up stories to write more! Show with words – even if they can’t read the text, it makes links with word and sound. There’s an unexpected ending – he’s going to eat a carrot , not the person / rabbit that you might expect. So much to do with it – the simple language lends itself to repetition, rewriting and easy comprehension. 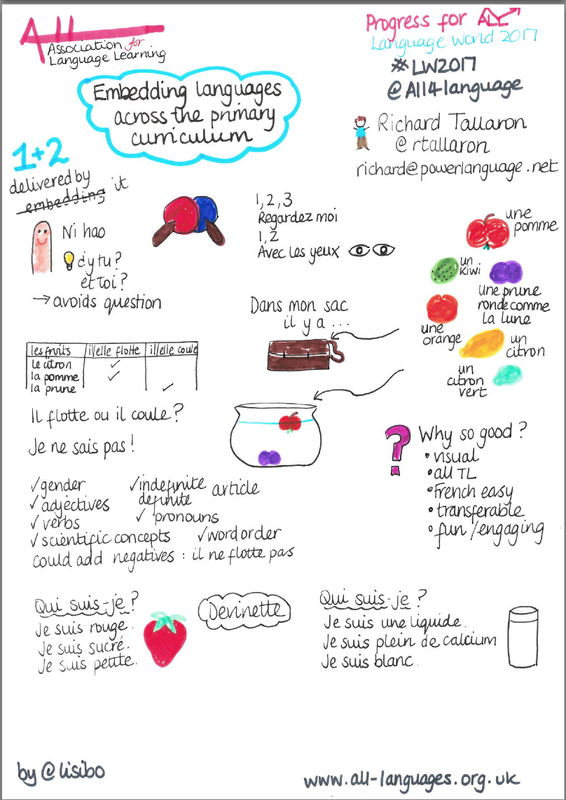 Looking at the (French cursive, joined up) writing – good or bad? Structure Je mets…. /Pongo… can also be used for setting table and talking about what you put down and then what you eat. ‘topics’ – fruit and veg. Make articulated veggie/fruit people – talk through process in French / Spanish. Looking at highlighted words – why? Some cognates, some links to ‘our’ language, some near cognates. 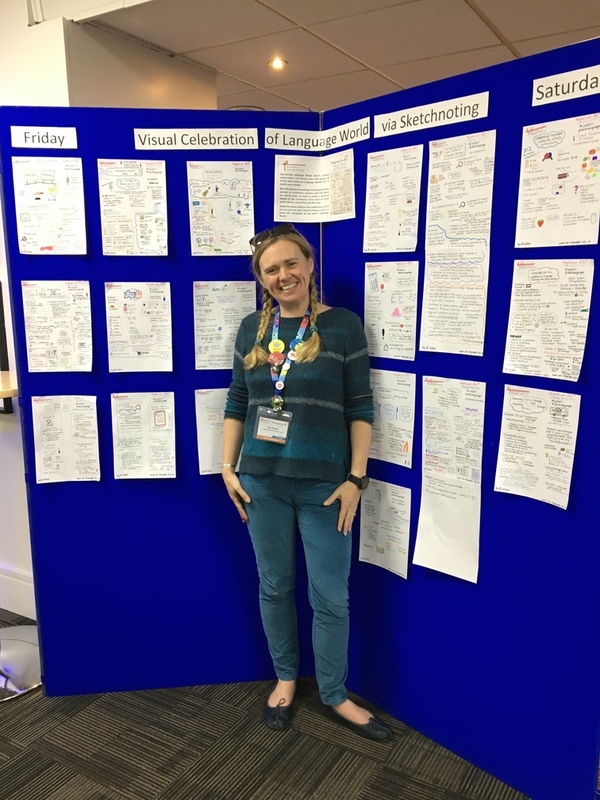 Jan finished with showing us some ‘sous-main’ or learning mats that she’d found from French schools to support recollection of language. A great idea. I’ll now be looking for some in Spanish! Pupils could lead activities – it wasn’t scary for them – they like the variety and also the opportunity to lead. A resource bank was made with reference to grammatical structures. 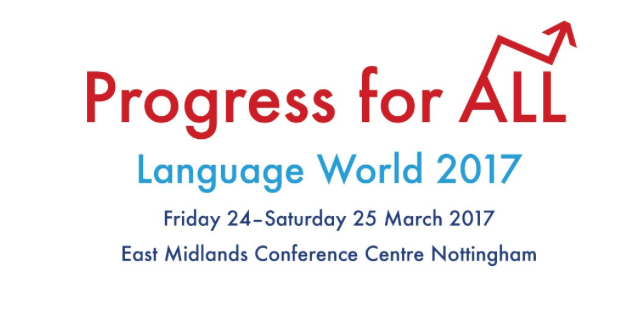 The opening of Language World saw a presentation by Anna Turney and Nick Fuller. Anna loved snowboarding and wanted to get good enough to compete. She moved to France after her degree, and decided that her best plan was to hang out with the French boys who’d know the place well (so her language skills came in very useful!) One season turned to three then she did a TEFL course, went to Japan and taught whilst still snowboarding at the weekend. In order to get sponsorship, she needed to win some races. Having played hooky one day to compete in a race, Anna crashed and ended up in hospital with 98% chance of walking again. In hospital, Anna had plenty of time to think and decide that she wanted to fight on. Language proved “fun” in hospital with misunderstandings and communication issues, but someone told her about sit-skiing which gave her new hope. After a year of not being able to do extreme sports, Anna had a go and discovered it was harder than it looked! After practice, Anna came back to England, was spotted sit-skiing and invited to join the development squad, but had to self finance. A mystery donor bought her first monoski and off she went, on the road to Vancouver. Anna set out to be the fittest and best she could, spending long periods of time away from home. Olympic values of friendship, excellence, respect, cooperation have been really important to Anna, and the buzz at Paralympics was enormous. Everyone has to wear team kit and it’s an amazing sight. When someone who’d won a medal came in, the whole dinner hall clapped. In Alpine skiing, each country is given an area of the hill, and countries need to work together to set courses. It is hugely competitive but there is a real togetherness about the whole experience too. The volunteers are amazing too. Anna’s achievements in Vancouver – 6th in sitting slalom with which she was really pleased. Anna acknowledges the debt she owes to all the people who have helped her – volunteers, family, sponsors, training partners – it’s a team effort. In London there will be 170 nations. Pierre de Coubertin saw Olympics as a sporting cultural coming together – it’s more than sport! The vision for 2012 is to reach young people around the world. That’s been done through linking schools across the world, reaching millions of kids. 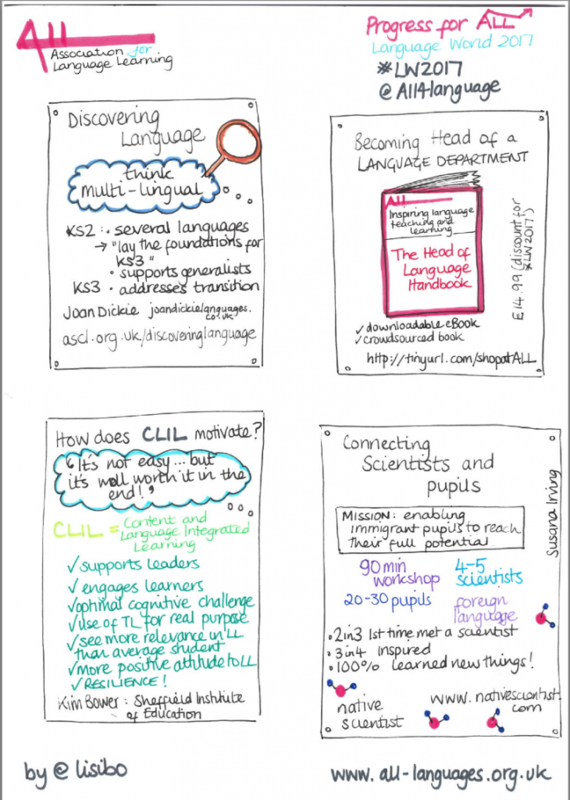 Cross curricular resources – themed and free! GetSet schools have a strong local agenda as well as a national / international one. Big opportunities to work together too – National Sports Week has just ended! Also Musubi in East Midlands where Japanese team will be based. Greenwich are offering free courses in Spanish, French, Japanese and Chinese – a focus on functional language. 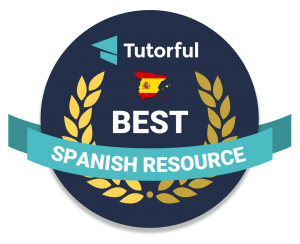 Let’s get cooking around the world – recipes in Spanish, French, Chinese, Hindi, Portuguese – encouraging schools to engage the community and parents in language teaching and learning. Get Set goes global – recognises that we’re literally just about to welcome the world to UK. In September – Get Set for the Olympic Truce – to promote peace through sport and culture. In November, we’ll be encouraged to choose our Olympic team to support and find out about it. 25th June 2012 World sports day in Sports week. Resources available from September onwards. There are rewards and recognition for GetSet network by filling in a short form – access to benefits and a plaque! Does the legacy of the Olympics revolves around West Ham vs Spurs? No, it’s more to it than that – it’s looking to inspiring young people, capturing hearts and minds, instilling values and inspiring lives. 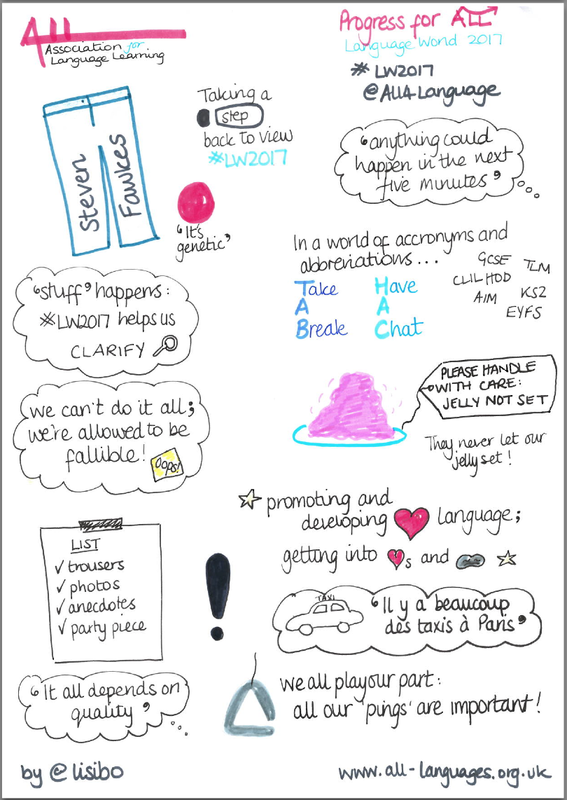 Really enjoyed this session as it brought together two of my favourite themes – languages and global / intercultural understanding.